Volareo aims to raise $20,000 and bring fairness and freedom to the music industry. Today, Volareo launches on crowdfunding site Indiegogo. Starting from $99USD for the early bird special, Volareo is the 1st independent smart speaker supporting open source to integrate with blockchain streaming platforms. Designed for those who value creativity, privacy and independence, Volareo aims to capture the blockchain music market first. It provides an easy platform for artists and users to interact and can be used to intelligently search for and discover music using voice, first in four languages: English, Dutch, Spanish, and French. Later, more languages will be added via OTA updates. Volareo’s first, but not unique, blockchain music streaming partnership with Musicoin makes for seamless and free listening for users, whilst fairly compensating musicians for each stream. The Volareo smart speaker comes preloaded with 500 Musicoins (the equivalent of $10USD) allowing you to tip your favourite artists straight away with your voice or by clapping. A double authorisation system allows listeners to verify all tips before they are sent. “Blockchain music has huge potential to drive much needed revenue to artists, particularly independent ones, transparently, directly and instantly. 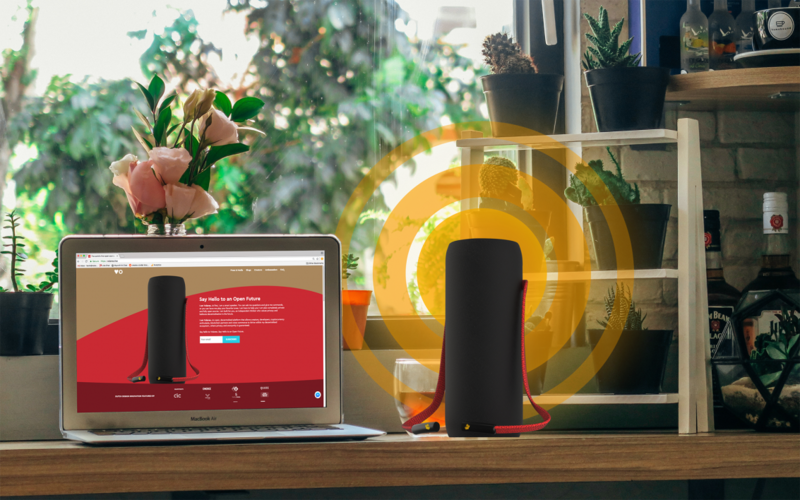 The listener gets the chance to connect on a much closer level with the artist, by being able to tip artists or buy merchandise, for example, via voice commerce”, explains Nick Yap, Volareo founder. Volareo is continuously partnering with new platforms such as Emanate, Choon, Soundeon, Jazz de Ville and many more. Volareo is also building an open software platform which will bring diverse blockchain-related streaming, concert ticketing and merchandising platforms together, so that users have the freedom to choose from a wider range of services, than just those controlled by big companies in the game. “Together with all users, we want to pave a new way forward to crowdsourced content creation. We want to build a platform that empowers people to connect”, Yap says. Volareo is a Rotterdam-based startup ran by consumer electronics entrepreneur and former Startup of the Year Founder (Netherlands) Nick Yap. Volareo’s open source smart speaker makes the benefits of blockchain accessible and cryptocurrency easy to use. Born out of a need for an alternative piece of high quality hardware, it focuses on user privacy and creating direct and meaningful relationships between consumer and content creator. Please contact press@volareo.live for media inquiries or visit Volareo’s press page for the media kit. For updates, sign up on volareo.live and join the community.